The planned mass rapid transit (MRT) project may be just what the city of Kuala Lumpur needs as a long-term solution to public transportation. But the MRT plan is today mired with controversy. Some resident associations have been up in arms about the potential disruption to their homes and likely increased traffic congestions during the construction phase of the mega project. Some are also questioning the proposed alignment of the MRT on the grounds that the Sungai Buloh to Kajang route does not reach the right catchment areas while unjustifiably passes through mature and wealthier neighbourhoods that have less of a need for public transport. Another oft-cited critique is that the Government should first fix other forms of public transport such as the bus system, which should cost much less to solve, before embarking on the multi-billion MRT. That then leads to the issue of cost can the Government really afford to fork out the estimated whopping RM50bil needed for building the MRT? There are also concerns about the Government's choice of making Syarikat Prasarana Bhd the MRT project owner. Critics argue that since Prasarana and its subsidiary RapidKL have failed at something as basic as creating an efficient public bus service in the city, that it isn't the best body to be owning the MRT. Not only that, Prasarana's track record is questionable. According to the 2008 Auditor-General's report, a number of troubling allegations were made over the past management of Prasarana, including the acquisition of land at inflated prices, the purchase of loss-making entities for no good reason and buying buses that didn't work properly. Its financial strength is another issue. Yet another grouse with the MRT is the choice of making Gamuda Bhd and MMC Corp Bhd the project delivery partners (PDP) of the MRT project, considering that these two companies are planning to bid for a significant portion of the whole project mainly the tunnelling works. To be fair, many of these concerns are being addressed. Consider first the worries of residents in pockets such as Taman Tun Dr Ismail (TTDI). What had heightened their concerns was the pasting of notices in their neighbourhood that some of their houses could be acquired under the Land Acquisition Act 1960 for the purposes of building the MRT track. Members of the public looking at an exhibition on the MRT project in Bangsar LRT station. In an interview with StarBizWeek, SPAD's chief executive Mohd Nur Ismal Kamal stressed that it was open to feedback from the rakyat. “This (the MRT project) is not about bulldozing ideas or pushing solutions down people's throats,” he said. SPAD has opened various lines of communication for public feedback on the project, especially on the alignment of the MRT stations, through public displays, its website and telephone lines. Nevertheless, a consultant says for a project that may cost up to RM50bil or more, there is little information about the stations, traffic flow, parking facilities, or fare mechanism. The environmental impact assessment (EIA) report, which has been made public, is another source of information on the MRT. Notably, the EIA report itself has raised a few issues about the MRT, such as traffic congestion, noise, dust and pollution and ground vibrations that could affect households from the building of the MRT. The report said the MRT project will affect 108,000 residential units in 403 lots where the 51km mass rapid transit line will traverse. However, the EIA report also recommended steps to overcome or mitigate those impacts. SPAD has said it would ensure the MRT project owner would follow the steps. Is Prasarana right for the job? As for the choice of Prasarana as the project owner, questions are raised as to its suitability. Not only are there questions about its track record and alleged past transgressions, there is also the concern about its financial viability. It has been reported that Prasarana had total debts to the tune of RM9.64bil as at end-2009 and has to repay bonds to the tune of RM7.1bil (in principal amounts) that will mature between 2011 and 2023. There are also reports that the Government has allocated RM2.5bil to pay for Prasarana-issued bonds which are due in November 2011. Prasarana has recently said it would be raising between RM5bil and RM10bil over the next five years via a bond sale to fund the light rail transit (LRT) extensions. It had also raised RM2bil in 2009. According to SPAD, there is sound rationale for the choice of Prasarana as the MRT project owner. “It is 100%-owned by the Ministry of Finance Inc and was set up to facilitate, coordinate, undertake and expedite infrastructure projects approved by the Government. As the MRT is a government-funded infrastructure project, Prasarana is the most relevant entity to be the owner of the asset of the (MRT) network. It also has a lot of expertise in owning public transport assets built up over the years,” explains SPAD's Mohd Nur. He adds that there is going to be a governance structure in place to ensure that Prasarana meets the high standards expected of it. Interestingly, Prasarana will play a key role to try to make money from real estate opportunities given to it by the government. The financial model being used for Malaysia's MRT is called “rail plus property” and is similar to what Hong Kong's Mass Transit Railway, which is often cited as one of the world's most-successful examples of a well-run and financial-viable inner city train project. According to a consultant familiar with the Hong Kong experience, it had the advantage of planning the system in the 70s when it was still developing. Another success factor was the strict check and balances imposed by the Government on the operator of the MTR. Shahril says that under his stewardship, Prasarana will become self-sustaining, with a target of breaking even by 2015. Prasarana has yet to reply to specific questions on its financial status. Shahril took over the helm of Prasarana in October last year and his mandate is to transform the asset owner and operator of several public transport providers. Two months after he came on board, he dished out a 2-year transformation plan while a five-year master plan is crafted. He also restructured the management team, tweaked the organisational structure and set a direction for the company. “We have to win the trust of the customer. If there is no trust, it would be tough. We also need to change the perception of Prasarana,'' he says. Back to the MRT. On the appointment of the MMC-Gamuda joint venture as the project's PDP, SPAD has explained that MMC-Gamuda will be the MRT project manager but with the added responsibility of having to deliver the project within an agreed time and cost. The fact remains though that the Government will be footing the bill of the MRT, which means MMC-Gamuda should stand to make a decent profit as project managers of the multi-billion project. It is understood that MMC-Gamuda were picked as the MRT projects PDP as they are the ones to have first pitched the MRT project to the government, having hired consultants to do a detailed study on it. MMC-Gamuda will also not be allowed to tender for any of the work packages except for tunnelling works. SPAD said the Government felt that an exception should be made as the PDP is the only local construction company that has experience in major tunnelling works. Still, the tunnelling work should again provide decent profit margin to MMC-Gamuda if they win the bid. SPAD's Mohd Nur also says that costs will be kept down through the implementation of a value management study where an independent party will scrutinise the project plans to ensure that optimum value is derived. Together with the “rail plus property” model, the plans sound good but that's only on paper. It is left to be seen if the MRT project will be carried out without any excesses and in the most transparent way possible. To be fair, one positive step has already been the setting up of SPAD. “Before, public infrastructure projects were just dished out to different parties, who subsequently needed to be bailed out by the Government. Now at least, there is a one-stop regulator that is trying to ensure that things get done correctly,” says one observer. 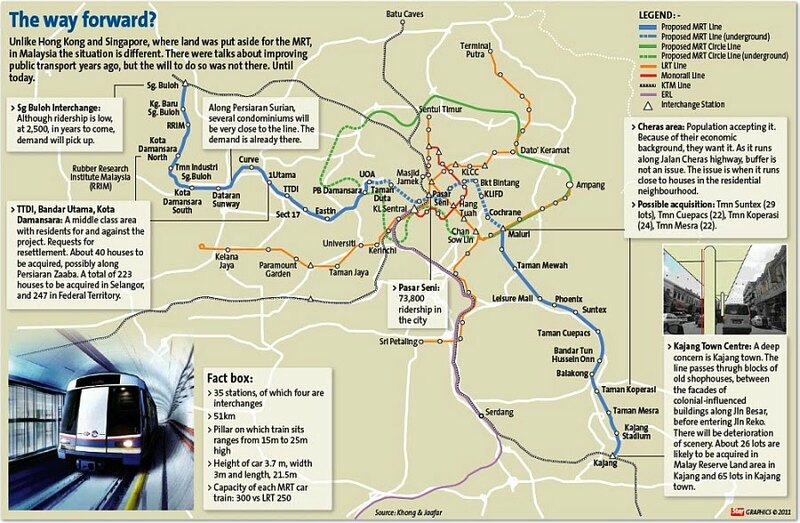 One of SPAD's first tests will be to decide on the alignment of the MRT, which is turning out to be a challenging job. “We're having to look at it from a myriad of perspectives and balance it all,” says Mohd Nur. Among the factors being taken into account are the social impact, engineering aspect or “constructability”, journey times, land acquisition costs, accessibility to users and ridership. It will certainly be interesting to see SPAD's final decision on the MRT allignment and the basis at which it came to that conclusion. The influx of tourists and investors from around the world, especially Asia and Europe, is set to change the real estate and infrastructure landscape of one of the most popular ski resort destinations in the world, Niseko in Hokkaido, the northern island of Japan. Currently there is still a lack of awareness on the potentials and opportunities there, which explains why it is still a relatively untapped market as far as real estate development and investment is concerned. According to Asia Pacific Land Bhd (AP Land) joint managing director, Low Su Ming, the pioneer developers from Australia, who are generally small fit outs, have taken more than 10 years to develop Niseko to what it is today. “The rest of the world are only now beginning to take note of Niseko. As such, properties here are still affordable but it is not so much about the cost of investment but the propensity for the properties to improve in value that is of great interest,” Low tells StarBizWeek. Low believes Niseko will continue to enjoy growth, adding that investment returns have been growing in recent years, with further capital growth expected. “Niseko is clearly a world-class ski location, with its real estate still a fraction of the price of other comparable international destinations. “This place, ranked by Forbes as the second snowiest place on earth and famed for its long ski season (from November to April yearly) and fine powder snow, has seen tourist arrivals doubling every year. “We see great potential and opportunities in this area. At this moment, demand for accommodation far outpaces supply,” Low says. AP Land is undertaking its maiden development in Japan – Shiki Niseko comprising 69 units of 1, 2 and 3 bedroom high-end residences with commercial component in the heart of the ski village, known as central Hirafu. The project is scheduled for completion by the end of 2012. Low says most investors have taken a long-term position and are comfortable to enjoy their asset and ride out any short-term volatility. “Niseko offers something unrivalled in Asia, with access that cannot be beaten by Europe and America. The tourism market here is one of the biggest in the world, and if the bullet train makes it to Niseko in the coming decades it will bring a massive influx of domestic tourists,” he says. He adds that Niseko is growing organically at its own pace. “In actual fact, we are under-supplied when it comes to commercial premises, and more shopping facilities will bring a new level of tourists to the area. “No doubt this will take time to manifest,” he says. In recent years, big property players from Hong Kong and Malaysia are making their presence felt in Niseko with land and whole villages exchanging hands. Their plan is to cater to the growing affluence in various Asian markets and higher demand for more lifestyle properties in Niseko. Hong Kong’s PCCW Ltd has planned to add 14,000 beds in Hanazono over the coming decade, including a couple of hotels and village shops and services. Besides APL, another Malaysian corporation, YTL Corp’s hospitality arm YTL Hotels & Properties Sdn Bhd has last April purchased Niseko Village located at the southeastern foothills of Mt Niseko An’nupuri. Kennewell says that with the Chinese yuan rising steadily against the greenback in the past several years, China represents a huge market opportunity as it is now much cheaper to buy a property in Japan. On what are the missing links in the Niseko tourism and real estate landscape now, he says: “Boutique shops, and personal services. “There is also a need for more cultural and international events to attract guests all through the year, though these are improving year on year,” he adds. GUOCOLAND (Malaysia) Bhd’s associate company is selling a piece of land in Malacca to Perbadanan Kemajuan Negeri Melaka for RM45 million. The associate, Continental Estates Sdn Bhd (CESB) — a property developer that also operates an palm oil estate — will use the proceeds for working capital and repayment of borrowings. Guocoland said in a stock exchange filing yesterday that the sale will result in a gain of about RM15 million to CESB and RM7.5 million to the group. The land, measuring about 202.5ha, is located in Jasin. SUNWAY Holdings Bhd’s construction unit has bagged a RM258 million contract to build part of the Legoland Theme Park in Johor. The project, which will take 15 months, is targeted to be completed on June 2 next year, Sunway said in a statement to Bursa Malaysia yesterday. Sunway Construction Sdn Bhd accepted the letter of award from IDR Assets Sdn Bhd. The project is expected to contribute positively to the Sunway group’s earnings from this year onwards, the group said. KUCHING: The Sarawak government has offered a piece of land next to the Kuching International Airport to AirAsia Bhd to build a dedicated low-cost carrier terminal (LCCT), said Deputy Chief Minister Tan Sri Dr George Chan. He said the LCCT would not only draw more air travellers but also boost the state's tourism industry and double its revenue. “The state government has offered land to AirAsia to set up an LCCT here. Now, AirAsia just need to build the terminal. They (AirAsia and the state government) are talking seriously,” Dr Chan, also the state's Tourism and Heritage Minister, told Bernama yesterday. AirAsia has plans to turn Sarawak into a low-cost air travel hub with extensive domestic and international connections. The plan to set up an LCCT in Sarawak was because the airport tax of RM51 imposed at the KL International Airport was considered too high by travellers. Dr Chan urged Malaysia Airports Holdings Bhd (MAHB) to seriously consider reducing the airport tax and charges so as to develop new traffic and to further promote the state's tourism industry. He said the high airport tax had hindered AirAsia from increasing flight frequency and introducing new routes in the state. PETALING JAYA: The construction cost of the entire 150km Mass Rapid Transit (MRT) urban transport project may run up to RM50bil, three sources said, two of whom are directly involved in the project. The third is an independent party doing consulting work for the MRT line. “When Gamuda-MMC first gave an estimate a couple of years ago, a figure of RM36.6bil was brought up for the 150km line,” said the source who is directly involved with the project. Land Public Transport Commission chief executive officer Mohd Nur Ismal Kamal said the Government was doing all it could to drive down the cost. “From the feedback, we will then consider the alignment and the length of the platforms for the stations, whether it is a four-car train or more,” Mohd Nur added. He said that once the public display was over, a target cost would be worked and agreed on. Once the tender was over, it may be different from the target cost, he said. “The MRT is not just a transport project. It will have a catalytic effect,” Mohd Nur said, adding that an independent party would scrutinise the project plans and ensure that optimum value was derived. The entire project will be fully funded by the Government and a special-purpose vehicle under the Finance Ministry would be set up to advise, manage and raise the funds. “Based on the average RM353m/km for the line, the entire MRT project (150km) could be worth RM53bil compared with the current estimate of RM36bil,” it said, commenting on the outcome of Syarikat Prasarana Negara Bhd's contractors' briefing on Thursday. The briefing was to provide an overview of the MRT project and the job opportunities available. The event was packed with more than 100 contractors, according to a Prasarana spokesman when contacted by StarBizWeek. CIMB Research said the briefing focused on the Sg Buloh-Kajang MRT line's project structure, alignment specifications, tender guidelines/timelines and updated cost breakdown. “The main takeaways from the briefing were the prequalification process that will start this month and the total estimated cost for Sungai Buloh-Kajang MRT line that is RM20bil,” it said. It said Prasarana would start the ball rolling with the elevated structure package (elevated portion is worth RM10.8bil of the total cost of RM20bil) which would be broken up into several sub-packages and was open to all contractors except the PDP. “Priority will be given to contractors with financial strength, expertise and track record. Contractors who do not prequalify will still be able to bid for the subcontracting packages,” it said. It added that this suggested the awards were likely to take place no earlier than May 11, while the July 11 timeline for the start of work was still intact. Prasarana and the PDP will work together in rolling out the award of the MRT packages and disbursing the funds via progress payments. “Funding/payment will be drawn down from a special company under the Finance Ministry,” it said.